Nouvelle Carte del La France indiquant les Routes de Poste, les Routes Nationales & Departmentales aved les Distances en Kilometres. 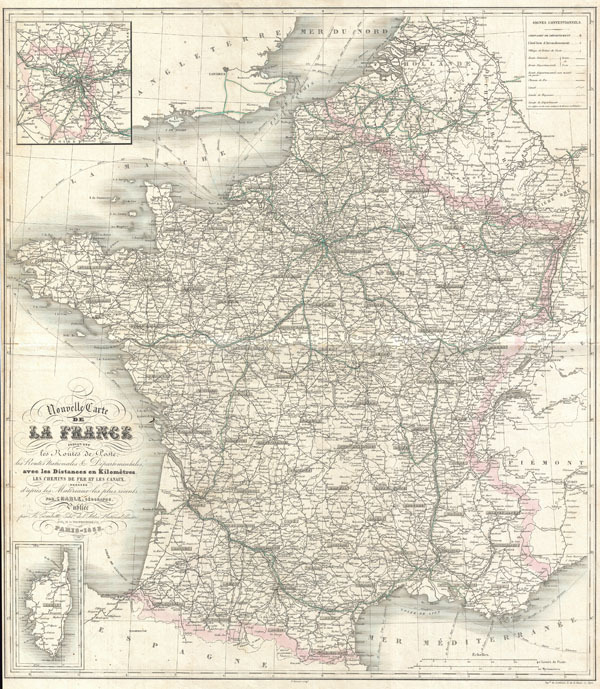 This is a folio format map of France issued with Victor Levasseur's 1852 Atlas National Illustre. Covers all of France as well as adjacent parts of Italy, Span, and England. Shows all Departments as well as postal routes, major cities, rivers, and roadways. Indicates mileage between most towns. Additionally shows ferry and shipping routes in the Mediterranean and in the English Channel. An inset in the lower left quadrant focuses on Corsica. A second inset in the upper left quadrant details the vicinity of Paris. Very good. Original centerfold. Narrow but intact right and left margins.